This is going to be a short post since I am in the midst of writing out thank-you cards from Kalebs second birthday, but I wanted to share these with you! We just bought a new house three months ago, and as any new homeowner comes to realize, saving money is key! I’ve started to make my own things here and there and let me tell you, making your own cards is so cost effective it saves you money in the long run! 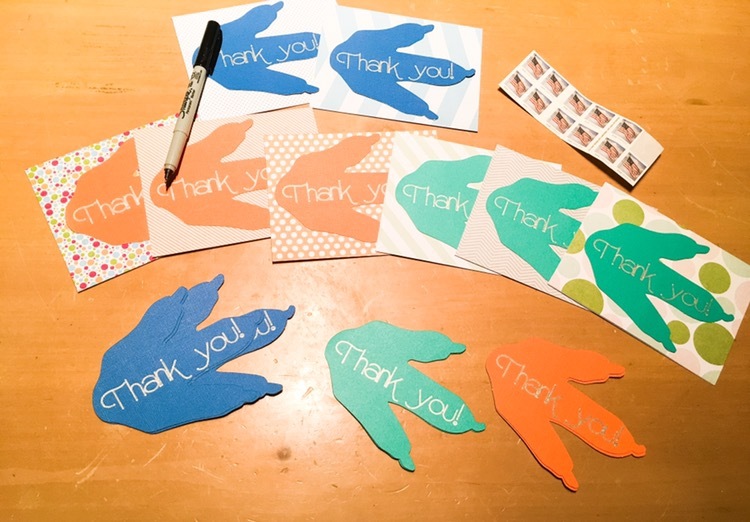 I went to my local Joann Fabrics the other day looking for blank notecards and envelopes so that I could make some custom dinosaur thank you cards for everyone who came to Kalebs birthday a few weeks ago. What I was not expecting was to walk out of the store with 3 boxes of blank cards (130 total!) for less than $15!!!! I mean, that comes down to 11¢ a card! Since moving into our new home I have taken on this notion of “perfect mom, perfect wife perfect house, perfect life”. And part of that delusion is making sure everyone I know gets a birthday card in the mail. By all means I am not perfect, there’s dishes in the dishwasher that need to be put away, animal hair has been building in the corners all week, but that’s ok. Because this is what life is. It’s ignoring the “chores” and spending the afternoon sledding with your little man. These cards were super easy to make. I cut out the footprints on my Cricut machine my lovely husband bought me for Christmas, and also had it write “thank you!” In silver on them. Used Elmer’s Dot Runner glue to fix the footprints to the cards, filled them out and sent them on their way! All in all including postage, these cost under 75¢ to make! What a deal!!! A Hot Digity-Dog Mickey Mouse First Birthday! Very nice! You’re right, greeting card prices have gotten crazy! I used to have a little Dino lover. . She’s too big to admit that now!